The current prediction for Sunspot Cycle 24 gives a smoothed sunspot number maximum of about 69 in June of 2013 (same as last month). We are currently over two and a half years into Cycle 24. Four out of the last five months with average daily sunspot numbers above 40 has raised the predicted maximum above the 64.2 for the Cycle 14 maximum in 1907. This predicted size still make this the smallest sunspot cycle in over 100 years. Predicting the behavior of a sunspot cycle is fairly reliable once the cycle is well underway (about 3 years after the minimum in sunspot number occurs [see Hathaway, Wilson, and Reichmann Solar Physics; 151, 177 (1994)]). Prior to that time the predictions are less reliable but nonetheless equally as important. Planning for satellite orbits and space missions often require knowledge of solar activity levels years in advance. 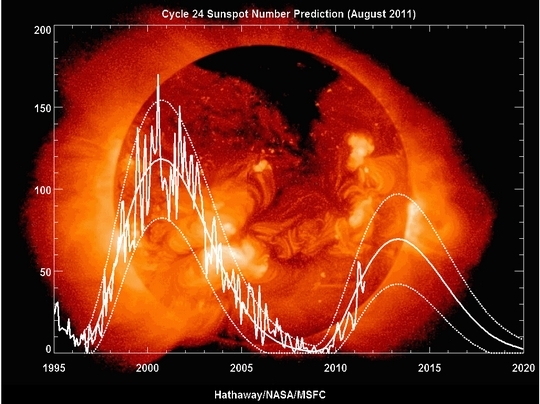 A number of techniques are used to predict the amplitude of a cycle during the time near and before sunspot minimum. Relationships have been found between the size of the next cycle maximum and the length of the previous cycle, the level of activity at sunspot minimum, and the size of the previous cycle. Among the most reliable techniques are those that use the measurements of changes in the Earth's magnetic field at, and before, sunspot minimum. These changes in the Earth's magnetic field are known to be caused by solar storms but the precise connections between them and future solar activity levels is still uncertain.